With modern smartphones, you can carry around instant e-mail access right in your pocket. Exchange Online from Office 365 works great with any of these devices and, of course, with Apple’s iPhone and Google’s Android devices. And although Microsoft was late to the party, the new Windows Phone 7 provides complete integration with all of Office 365, including Exchange, Outlook, and Office applications. You can use your web browser to access Exchange Online. When you use your web browser to access Exchange, you are using what has been termed the Outlook Web Application. 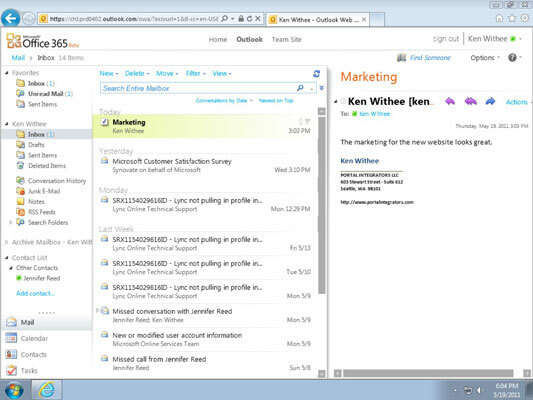 Office 365 provides a very rich experience for working with enterprise e-mail right from the browser. Using Internet Explorer to access the Outlook Web App is shown here. Windows Phone 7 has amazing integration with very minimal configuration. The Outlook client for Windows Phone 7 is built right into the device. No need to download or install. Just point your phone to your Exchange Online e-mail and you are good to go. One of the exciting new features of Exchange Online is the ability to integrate with the Research In Motion BlackBerry cloud service. Microsoft has worked closely with Research In Motion to provide organizations that use the BlackBerry service the ability to integrate with the Office 365 offering. In the past, Mac users have faced a difficult decision. Use a Mac and struggle with compatibility with the corporate e-mail system or use a PC and use Outlook for full integration. Exchange Online supports the popular Outlook for Mac 2011, which provides similar integration to Outlook for the PC. By using Outlook for Mac 2011, you can access your Exchange Online e-mail, calendars, tasks, and contacts.